This stunning villa is one of a small collection of luxury villas situated on a private domaine of 20,000m2, in the countryside outside Marrakech, just a 20 minute drive away from the famous Jemaa El-Fna square and its colourful souk. Situated just off Route Ouarzazate, guests will have direct access to the Ourika Valley, the ski resort of Oukaimeden and the gorges at Ouirgane. 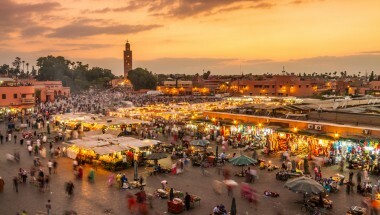 A two hour drive over the Atlas Mountains will take you to the beautiful city of Ouarzazate and the striking landscape of the Zagora desert. The domaine is a gated and secure complex of 20,000m2, with 'Andalusian Alhambra-style' gardens between the private villas here. Surrounded by a 2.4m high wall, the villa is both very private and has the largest garden of the domaine, with bougainvilleas, roses and palm trees, and a 14m private swimming pool. 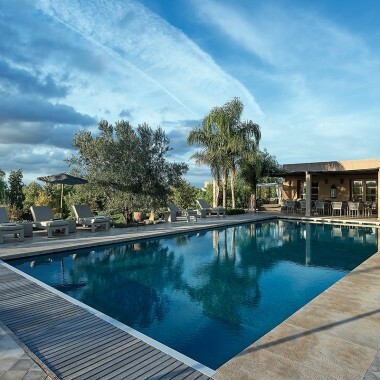 As well as its own garden and pool, guests will also have access to the domaine’s pool house, a large swimming pool (perfect for children), a tennis court (with complimentary racquets) and a petanque court. The interiors combine the original design and architecture by acclaimed architect, Charles Boccara, with tasteful modern touches. Antique and contemporary pieces have been carefully selected to give the villa a sense of calm and serenity throughout, with the use of traditional Moroccan 'tadelakt' wall finishes and Fez tiled floors, offset by souk and market finds. The living room ceilings are almost 5m in height, with decorative cornicing and small skylights which flood the room with light. The accommodation is just on one floor, with a living room, dining room/loggia, two patios, a television room, four bedrooms and four bathrooms – all surrounded by the lush gardens. Amenities include satellite TV, air conditioning, Bose speakers and Wi-Fi. A baby cot and Wi-Fi are available on request. The property is idea for retreats, including yoga, pilates, meditation, and drawing/painting. The property is also suitable for special events including weddings and birthdays. There is on-site Spa and Massage. 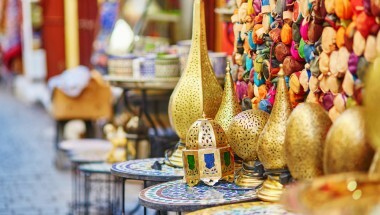 Yoga sessions, cooking classes and guided tours of the city, or day trips to the seaside or Atlas Mountains, can all be arranged on request. Large living room. Small traditional Moroccan alcove-style living room with TV, opening to the gardens. Kitchen, leading to a second terrace, which can also be accessed by the living room and the winter patio. Bedrooms: Each room has its own ensuite bathroom and individually-controlled heating and air conditioning. All double bedrooms have their own TV. Akhdar Room: Queen-sized bed, the bedroom can accommodate an additional baby cot (available on request). The room features a TV with satellite channels, air conditioning and opens to the main patio and garden. The ‘tadelakt’ ensuite bathroom with bathtub has a hairdryer and aromatic organic toiletries. Chemaia Room: The bedroom can accommodate either a queen-sized bed or two single beds, and an additional baby cot (available on request). The room features a TV with satellite channels, air conditioning and has three French doors overlooking the garden and swimming pool. The ‘tadelakt’ ensuite bathroom with shower has a hairdryer and aromatic organic toiletries. Mehaya Room: Featuring a king-sized bed, the bedroom can accommodate an additional baby cot (available on request). The room features a TV with satellite channels, free in-room private safe, air conditioning and overlooks a shaded terrace at the rear of the villa. The ‘tadelakt’ ensuite bathroom with shower has a hairdryer and aromatic organic toiletries. Amara Room: A triple bedroom with 3 single beds. at the rear of the villa overlooking the shaded terrace. The has air conditioning and the ‘tadelakt’ ensuite bathroom has a shower supplied with hairdryer and aromatic organic toiletries. This stunning villa is one of a small collection of luxury villas situated on a private domaine, just a 20 minute drive away from Marrakech. Set within a large garden, the villa is very private and has its own heated swimming pool. Guests can also use the domaine's tennis court and pool. The property is very suitable for family holidays, special events and yoga retreats.